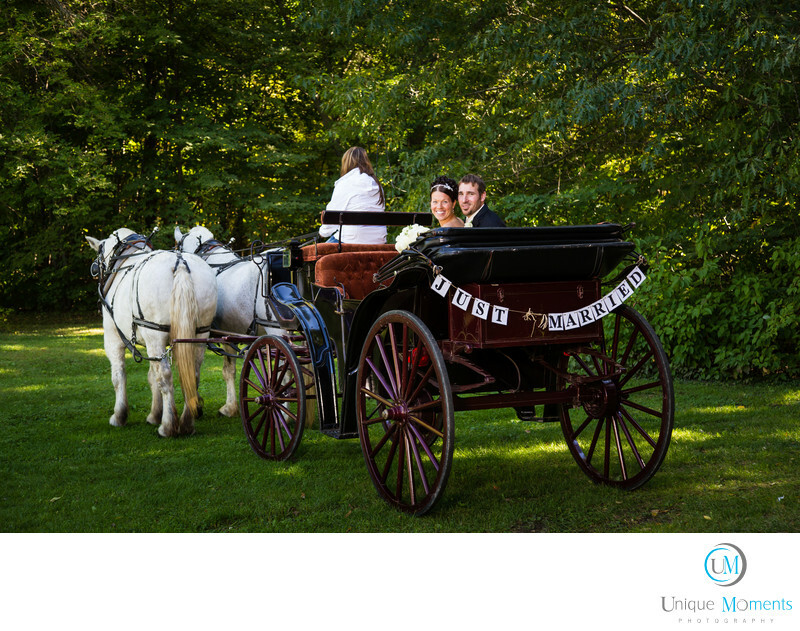 Just Married on the back of a horse and carriage was a great image for this lovely bride. Unique Moments Photography from Gig harbor Washington always encourages their clients to put personalities and interests into the wedding photography. Our bride loved horses. When she told us she was going to have a horse drawn carriage for her wedding, we knew she was going to be a perfect fit for our style of photography. Off camera flash to camera left lighting up a beautiful couple, afternoon back light coming through the trees and a quick ride around the Horse and Hunt club made a wonderful keepsake image. We can't think of a better way to close your album then with an image like this. If you and your fiance have hobbies that you do together, lets talk about the possibility and creating something different for your wedding images. We love it when our clients want to get creative. Thats How we came up with Unique moments Photography. Keywords: Dayna and Adam wedding (6).